It’s been almost a year since Google announced a new way to automatically organize your inbox using tabs called ‘Primary’, ‘Updates’, ‘Social’ and ‘Promotions’. 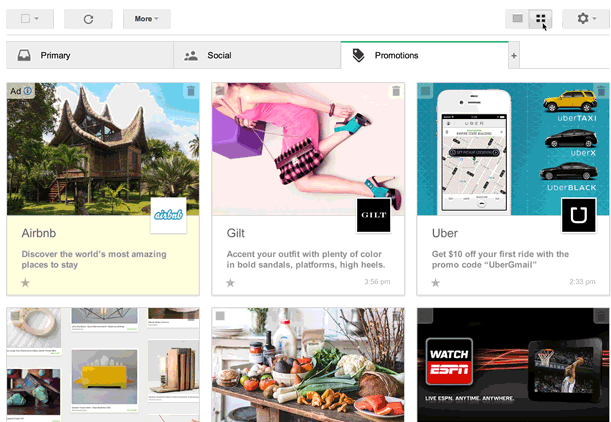 And today, Google has revealed it’s introducing a new way of displaying images specifically within the Promotions tab. The idea here is that promotional emails typically have many images embedded, be it an item of clothing or new mobile phone. By rolling out a new grid-style view of this tab, Google hopes to make things a lot prettier and appealing. And it may even help appease e-marketers who were critical of the way this new tab handled their handiwork, given that it was filtered away into a dedicated folder some may regard as ‘spam’. With this new grid-style view, it could look a little something like this instead. This new view of the promotions tab isn’t open to everyone yet – you will have to apply to participate in a field trial. If you’re selected, you’ll be able to switch to this new view if you have the Promotions tab enabled. Interestingly, grid view will also feature infinite scrolling, a technique that basically stops the scroll bar from reaching the bottom of the page.